Workers digging underneath the library of Florence’s famed Uffizi Gallery to build a new elevator have unearthed the skeletal remains of more than 60 people dating back to late antiquity. Coins found in the graves range in date from the end of the 4th century A.D. to the beginning of the 5th, but of course we don’t know how old the coins were when they went underground with their owners. Radiocarbon dating, DNA testing, stable isotope analysis and osteological examination will help determine the time of death, where they were from, their diets, physical condition, social class and hopefully cause of death. Over the five months of excavation, archaeologists have thus far seen no evidence of trauma to the bodies, so they were not killed by violent means. Their bones don’t show the signs of malnutrition either, so they didn’t die in a siege or famine. It seems they were felled by illness. Soil samples taken from around the remains indicate they were interred either simultaneously or within a very short timespan. That the bodies were buried to take up as little space as possible, mainly head to toe, and in uneven groupings with children placed in the small empty spaces is evidence that they were done in a hurry, likely as the result of an outbreak of contagious disease. This area was just south of the Roman walls and prone to the alluvial floods of the Arno. The earliest remains found on the site were architectural and lapidary remains that appear to be construction debris dumped during the city expansion of the late 1st, early 2nd century A.D. The use of the spot as a dump ended by the 5th century when it began to be used as a necropolis. The choice of location — over a dump next to a river regularly in flood — confirms that the burials were an emergency, probably done in the summer while the river was at its lowest. The timing could coincide with the Plague of Justinian, an epidemic that devastated the Byzantine Empire and what was left of the Western one during the 6th century A.D. 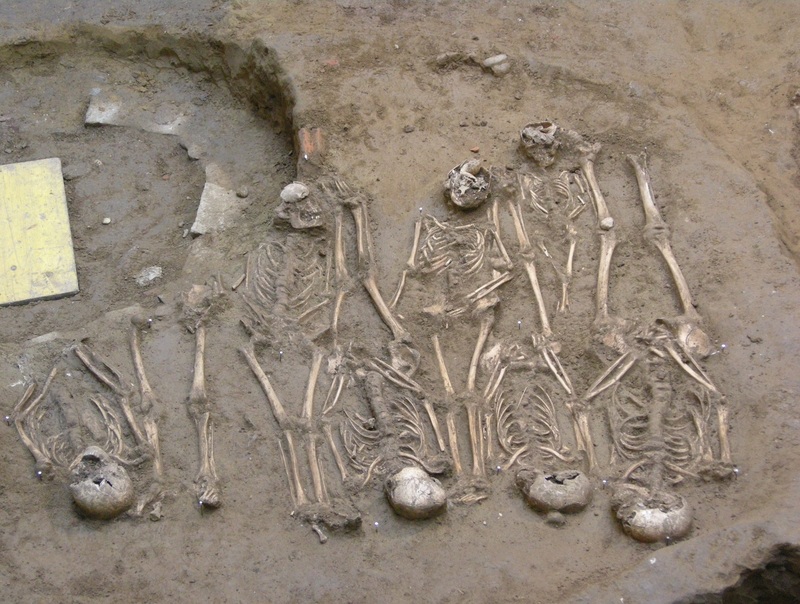 Recent DNA studies of 6th century burials in Germany have found that the Yersinia pestis bacterium caused Justinian’s Plague like it would the Black Death eight centuries later. The bones have been documented in situ and once fully excavated will be studied by Italian archaeologists in conjunction with experts from the University of Mainz who specialize in paleogenetics. Researchers hope to find pathogen DNA that will identify which deadly contagion claimed the lives of the people buried. Besides bubonic plague, possible candidates include cholera, dysentery and influenza. 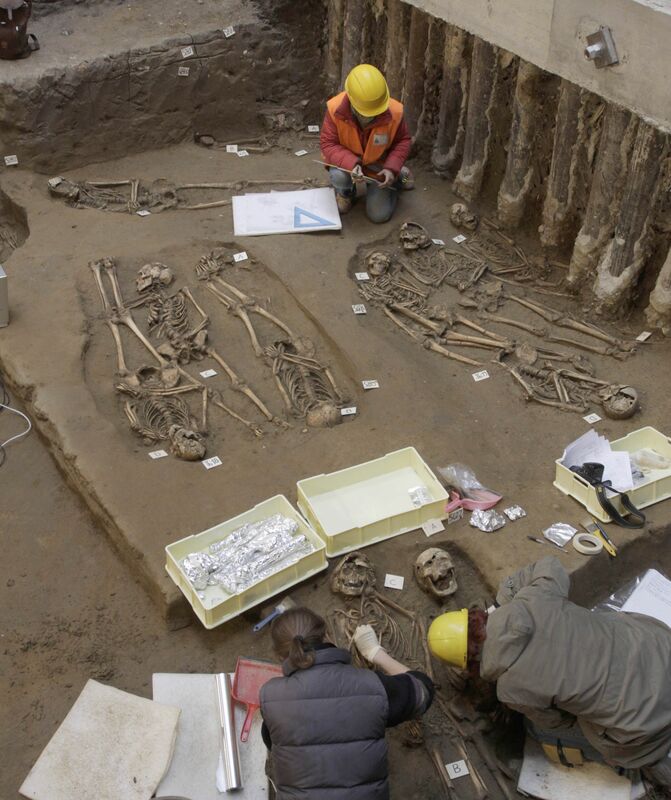 Archaeologists hope the mass grave will fill in important blanks in the history of Florence in late antiquity. 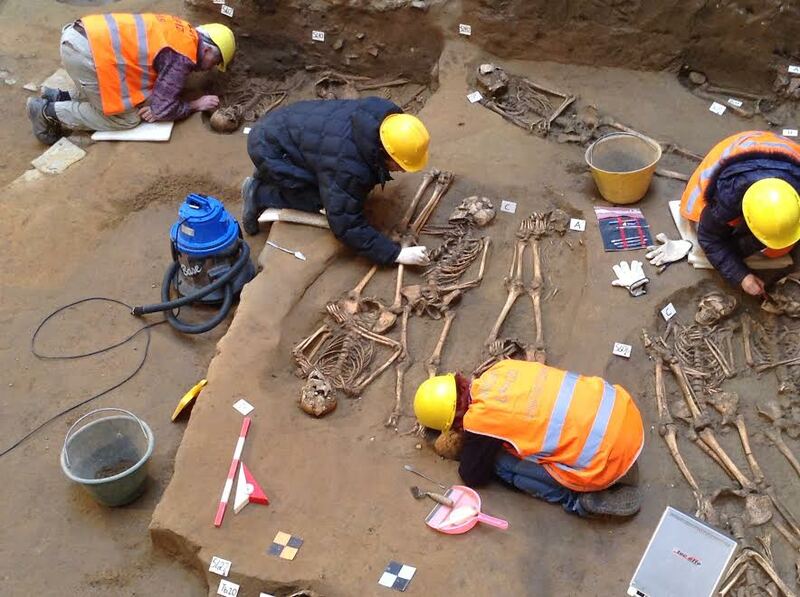 Up until now, very few human remains from this time have been found in various parts of the city. 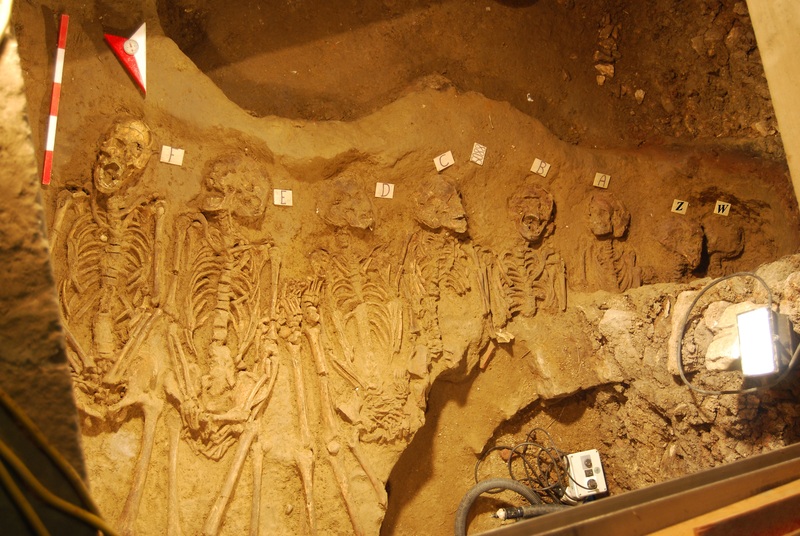 Finding dozens of skeletons in one place provides researchers with a solid sample size that can testify to the living conditions, health, nutrition, work of the Florentine population during a period that is poorly documented. The five months of excavation were filmed in 3D to make a documentary that can be exhibited in the new addition that is expected to double the gallery space of the Uffizi. The skeletal remains themselves will be reburied somewhere in Florence once the studies are complete.